Play NY > Is Online Poker Legal In New York? 4 Online poker’s chances in NY? Online poker in New York sits in the same legal limbo it does in most states. There are those that will tell you the act of playing poker online isn’t against the law. However, these same people will have to admit operating an online poker site inside the state’s borders is a crime. In fact, there aren’t many willing to test local law enforcement’s resolve on this point right now. Of course, they will also tell you federal law prevents financial institutions and payment processors from helping you get money on and off the many offshore online gambling operations. However, nobody is currently being prosecuted for playing the game. Others will tell you gambling of any kind is illegal in New York. That is, unless you’re doing it at a licensed and regulated operation. Those are Native American casinos, racetracks authorized to host slot-machine style video lottery gaming machines, or one of four new commercial casinos recently licensed to do business across the state. Some think poker is a skill game, and the law should not apply. However, New York gambling laws include a clause that expressly states games of chance where skill may also be a factor are still illegal. It’s that in the absence of legislation making it legal to operate an online poker site, online poker is against the law. However, most agree that legislation is as close to passing New York online poker as it has ever been. Section 225.00 of the New York Penal Code clearly states a person engages in gambling when that person stakes or risks something of value upon the outcome of a contest of chance. It says any contest, game, gaming scheme or device in which the outcome depends on chance, even if the skill of the player may also be a factor, should be considered a game of chance. Ultimately, it also says any activity similar to this is illegal. The exception is if you’re playing the the state lottery or gambling at a licensed facility. Those include horse racing and pari-mutual wagering operations, Class III Indian Gaming facilities, authorized video lottery terminal operators, or any operator licensed by the New York State Gaming Commission. It also now includes one of four licensed commercial casino operations Upstate. Poker is a popular game in New York. A number of Native American casinos host live poker rooms. Moreover, three of four new commercial casinos that recently opened in the state offer poker. In fact, these poker rooms have already proven to be the among the busiest aspects of these new casinos, like Rivers Schenectady. When it comes to online poker, a large percentage of the population lives within a couple hours drive from New Jersey. There it is legal to play, even for visitors. Plus, there are any number of offshore online poker sites willing to accept players from the US. Of course, it is difficult to get money on and off these sites. However, it is not impossible. In fact, these operations are regularly filled with players from New York state. 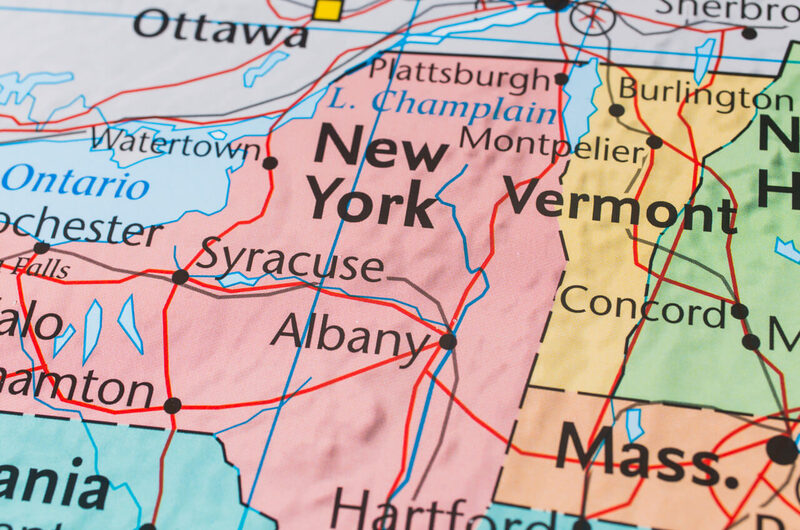 Lawmakers in the state have been considering legalizing and regulating online poker in New York over the past couple of years. In part, they say, to protect New Yorkers from the offshore websites operating with no regulation, fraud controls, or age restrictions. Online poker’s chances in NY? Online poker legislation ends up on the floor of the legislature every year since 2014. At first, this legislation was just a discussion starter. However, in 2016 a bill passed through the Senate Racing, Gaming and Wagering Committee. It marked the first time online poker legislation pushed past the introduction stage. The NY Senate passed the bill by a vote of 53-5. It was the first time any chamber of the New York legislature passed an online poker bill. However, the 2016 legislative session ended in June without any action from the State Assembly. In fact, New York adopted a carry-over policy for bills in a legislative term. That means the online poker legislation will not have to start from the beginning again. For the Assembly, this means the bill will start the year in the Codes Committee, with hopes it can pass through there to Ways and Means, and then Rules, before going to the Assembly floor. The Senate will have to vote on and pass the bill again, but at least it will not have to go through the committee stage. Ultimately, this means New York lawmakers could get an early start on online poker legislation in 2018, increasing the chances it passes.